Each month Patter Cross shares a word and teaching based around that word. 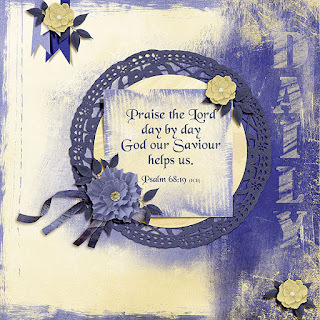 She shares very encouraging teaching and lovely artwork based on the scriptures she shares. When I searched for what scripture I wanted to use on my digital artwork, I found in the International Childrens Bible the verse I have used. Day by Day our Saviour helps us. Day by day He provides our daily needs. Day by day he asks us to take up our cross and follow Him. We do not have to be concerned about tomorrow... only just this day.